When Bellini wrote The Capulets and the Montagues in 1830, trouser roles were on their way out. Romeo was the last major role of this kind in Italian opera. To see Joyce DiDonato play Romeo in San Francisco Opera's mesmerizing current production of the work though, is to yearn for more of these cross-dressed parts in twentieth and twenty-first century operas. Despite the fact that most of the opera sounds like a jaunty triumphal march -- which is somewhat disconcerting when the performers on stage are singing lines like "Death to the Montagues!" and "Prepare yourself for a massacre!" 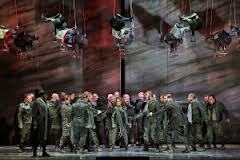 -- DiDonato's fierceness and force of will makes the music and text seem like they are perfectly in alignment. Dressed in costume designer Christian Lacroix's modish, Victorian-street-urchin-meets-biker-boy garb, the performer oozes virile masculinity. I wouldn't be surprised if nearly every woman and man in the house, regardless of their sexual orientation, secretly fantasizes about playing Juliet to DiDonato's Romeo. The flexibility and fluidity of the performer's voice is such that she can make even the most feminine-sounding run at the very top of her range sound testosterone-laced in this production. At times, DiDonato's vocal power makes her come across as sounding more like a countertenor (or perhaps even a castrato, if I may hazard a guess as what this kind of singer sounded like) than a mezzo soprano. And there's also a softness at the edges of her voice which makes the character seem entirely vulnerable. There are many things to recommend this production, including Lacroix's costumes, the San Francisco Opera orchestra's emotional yet punctilious playing, Guido Levi's mood-contorting lights and Vincent Lemaire's expressionistic set design, not to mention a stellar cast, which besides DiDonato, features Nicole Cabell as Juliet, Saimir Pirgu as Tybalt, Eric Owens as Juliet's father, Capulet, and Ao Li and Lorenzo, the Capulets' physician. DiDonato, however, is worth the price of admission alone.